To get a closer look of the pictures, just click in the center of them..
Yalta is probably the most famous spot on the Crimean peninsula, the southern tip of the Russian empire in the Black Sea. In February 1945, Stalin, Roosevelt and Churchill held talks in Livadia Palace, the summer residence of the former Tsar. Churchill resided in the neighboring ‚Alupka Palace‘, Count Woronzow’s moorish fairy-tale castle. Michail Woronzow, Bessarabia´s and Crimea´s General Gouvernor and one of the most richest men in the Russian Empire owned huge areas of land and had ‚Alupka‘ built at immense costs between 1828 and 1847. There he started his first vineyard and later on imported new grapes to the Crimea, such as Sémillon, Aligoté, Pedro Ximenez and Cabernet Sauvignon. tsar Nicolas II., who settled down with his family in Massandra, the neighboring village, started up his own vineyard and had miners penetrate deep into the rock to build seven galleries on three levels, thus providing ideal storing conditions, as the temperature only varies by 1 degree between 13 and 14 degrees Centigrade and because of a natural humidity of 90-95%. The barrels are made of regional oak and are mostly 20 – 40 years old, although some are considerably older. They are not replaced regularly by new ones, but only repaired if necessary. The vinification methods are traditionally similar to those of port, sherry and madeira in their respective countries. In 1898, Alexander Alexandrovic Yegorow was ordered to Massandra. He survived the ‚Revolution‘ in 1917 and, despite his pre-revolutionary past, was appointed Master of Massandra. His nephew, Yuri Yegorow became the third generation master of these wine cellars after his parents had been executed by the NKDW. Yuri was permitted to present his wines in London, a family tradition still in existence today and carried out with immense pride. This is a definite stroke of luck for Massandra. This extraordinary quality of wines, based on the traditional vinification methods and furthermore the well-stocked wine cellars of Massandra, which easily could have been lost during the ‚Revolution‘ are owed to the Yegerow family. The wines were safe in Massandra during the ‚Revolution‘ as the entrances to the galleries were walled up. When the ‚Red Army‘ took over the Crimea in 1920, they found the wine cellars completely intact. 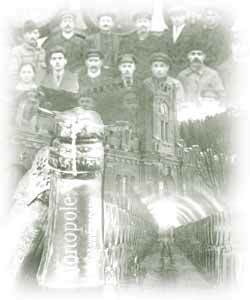 In 1922 the wine stock from all the Tsar's palaces in Moscow, St. Petersburg and Livadia was ordered to Massandra by Stalin and put under lock. Soon after that Massandra again took up its wine production. As a result of this ‚Revolution‘, a minor loss in production in the 1920´s has to be accounted for. At the beginning of 1941 the vineyards were endangered by approaching German troops. Alexander Yegorow started to evacuate the precious contents of his cellars.The last load left Massandra, together with Yegorow on September 21st. The German Invasion of the Crimea began on November 8th. The wine cellars´ contents, which were hidden in three different places were returned to Massandra at the end of 1944. When the Conference of Yalta took place in 1945, everything was back in its usual place, as during the Tsar period.